Peter is far less famous than his late brother Robert, who was as good at self-promotion as he was at making great wine. Peter keeps, in his own words, "plugging along" at 97, as president of the Charles Krug winery, Napa's oldest. He runs the place with his two sons Peter Jr. and Marc. "Peter is really respected among winemakers," says wine writer W. Blake Gray. He chairs the electoral college of the Culinary Institute of America's Vintners Hall of Fame, which has selected Mondavi and six others for induction this year. "We can't ignore the contributions made by Peter, who was a quiet man and an experimenter in the winery," Gray says. "He came up with techniques for cold stabilization in particular that brought a fruit flavor to chardonnay. At the time that Peter was working on it, Chardonnay was a really minor grape here, and now it's the most popular wine here by a large margin. And I think you have to give Peter Mondavi a lot of the credit for that." I visited Mondavi at his winery a few days ago, and asked him to take us back to the early forties, when his father Cesare and mother Rosa moved the family from Lodi to St. Helena, taking over Charles Krug. At the time, the Napa Valley had more acres of prunes and walnuts than winegrapes, and Mondavi recalls that for all its history, the Krug facility was no prize. "I mean it was very basic," Mondavi says, "and when dad purchased the property, the main building was in shambles. I mean dirt floor, there were no tanks to speak about. It actually had to be rebuilt, and of course even now today, we're doing a retrofitting job all over again ." I asked Mondavi if he ever thought, when he first started, that the valley would be as full of wineries as it is today. "No I could never imagine that many wineries," he says. "It's unbelievable. In those days the economy in the wine business was very, very slow. But plugging along all those years, we just kept on plugging, because we liked the wine business. You have to love this business in order to stay with it, because it has its ups and downs." What was his approach to making wine early on? "We were very green at it in those days, put it that way. We were looking for fruit, pleasant wines to drink. And of course this is where my research was in cold fermentation of the white wines and the roses. And that brought out the great character of those wines." Chardonnay today is the most popular wine in America, with all that apple and pear and mango, etc. That's because of Mondavi's work. "I never followed all those descriptions," he says. "But I knew when the quality was good, it was good." Mondavi was also the first in Napa Valley to import French oak barrels to age Cabernet Sauvignon, and some of the wines he made in the fifties and sixties are still prized by collectors. As we talked, sons Peter Junior and Marc walked in and poured us a taste of the winery's signature bottling, a 2008 Vintage Selection Cabernet Sauvignon. The brothers have spent millions replanting vineyards and modernizing facilities, and the wines are winning raves for both quality and affordability. For all the changes, Mondavi has fought to keep the winery small. That's in contrast to his more ambitious brother, who took his Robert Mondavi Winery public, and then had to sell out. "I don't want the sons to develop too big of a business where they have to sell it," Mondavi says. 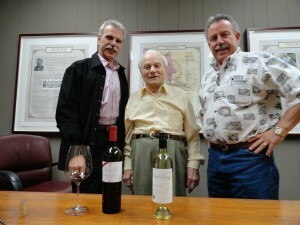 It's a lesson Mondavi took from his father Cesare. And family continuity is the legacy Mondavi says he's leaving behind. "For one important thing, being able to perpetuate the business. I mean as a family business. And that I'm very thankful of. And of course the grandchildren, three of them in the wine business. Yeah, in other words, to me, it's a wonderful legacy to leave the winery in their hands. I just do the best I can. I've laid all the groundwork. And I think they're in pretty good shape for the future."